A Southern Grace: my muse? Coconut and almond is definitely a favorite here, too. The ooey gooey texture here is perfect for something that tastes like a candy bar - yum! This sounds like the perfect brownie!! Those look sinfully moist and delicious! Oh heavens, those brownies look divine! I can't believe how clean the edges look. They look downright fudgy and delicious. The Almond-Joy combo never gets old! I'm getting goosebumps thinking about the flavors in that little beauty Grace. Oh, you devil! Almond Joys are my favorite chocolate candy! I love gooey brownies and bars, and these look incredible! I whistle a happy tune when an Almond Joy is nearby! These look incredible! Almond Joy is my very favorite candy bar - E.V.E.R! I am loving these babies... gooey and decadent. Using both shredded coconut & extract is brilliant! This is the kind of gooey that I love, creamy and very rich in flavor...chocolate, coconut and almond...perfect! I love coconut and this dessert sounds amazing and they look like a piece of heaven!!! this is perfection!! thank you! So good. I am not always here because I love sweets, but they do not love me. But you are the best of the best. Good to connect. mmmmm Grace these are to die for of course! Sounds like a delicious combo. And way prettier than the candy bar! I need a muse. One that involves chocolate. All brownies are most certainly female. Because they're awesome. Obviously. :P Add coconut and they are EXTRA awesome. So...maybe they're female squared? I'd say the Almond Joy makes a perfect muse! I love how gooey these bars are and the fact that there's texture from the coconut! The only time I've been depressed I'm allergic to chocolate. Una combinación muy rica mi querida Grace ...luce húmedo y tentador,abrazos hugs,hugs. That's my kind of muse and my kind of result! Almond joy is one of my fav treat, this makes me super happy!! yummy! What a delicious medley of flavors! You have a wonderful muse. A cream cheese swirl brownie is a lovely thing, but transforming it a la almond joy is on a whole other order of magnitude. Love that filling! as much as i can, i make a lot of baked goods with coconut-cream cheese. i mean really its like heaven to me. and then throw in some salty, roasted almonds? hello! It's totally in my plans to make an Almond Joy protein bar in the near future, so I guess we have the same muse! Chocolate, coconut, almond, cream cheese...look at the listed droolworthy ingredients! These tasty bars look absolutely delicious! 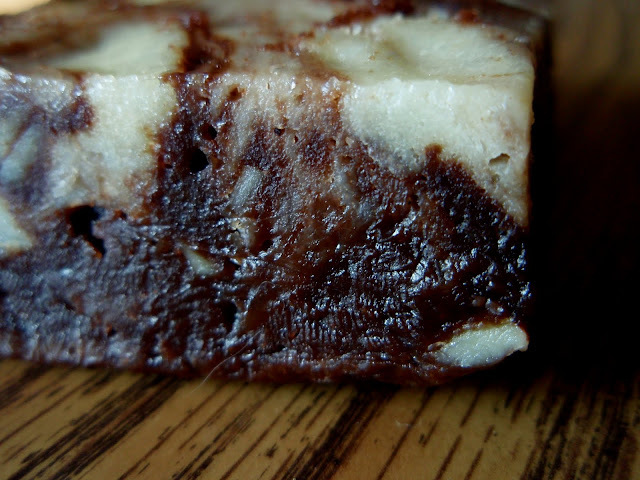 mmm, I could lose myself in the chocolatey depths of that last photo, which looks close to fudge... So dense, I can see fingerprints! 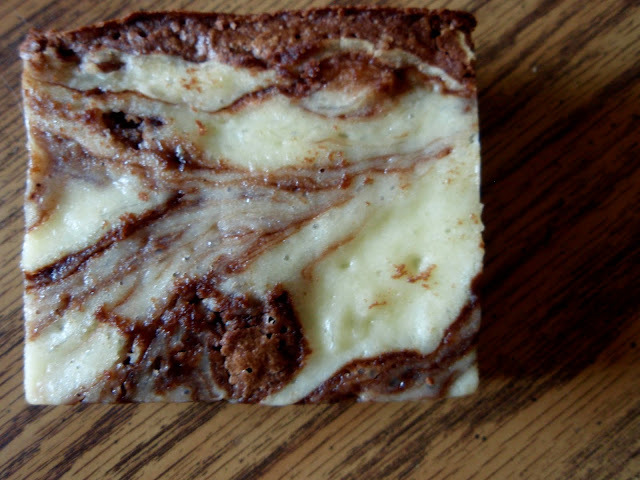 That is so much better than just a regular cream cheese brownie!